Jo Seok-Moo graduated from a prestigious university, but he pursued his dream of becoming a musician rather than finding a traditional job. Jo Seok-Moo did not become a musician and because of his advanced age, he could not land a decent job. He then began working at a security service company. There, he met Kang Whee-Roo for the first time as his customer. They have have been married for 3 years now, but Jo Seok-Moo asks for a divorce. They do not have very much in common. Jo Seok-Moo has a stubborn personality and enjoys spending time alone, while Kang Whee-Roo is easy-going and has a positive personality. In front of them, the married couple of Jin Yoo-Young and Lee Jang-Hyun appear. Jin Yoo-Young is Jo Seok-Moo’s first love. Loved Saikou No Rikon Eita was great in it, hope this will be good too. I am so glad to see all my favourite actresses coming back this summer. Love Bae Doona to bits in Sense8. I haven't watched the Japanese version but I hope the remake will have its own beauties and values. this is on my list dramas to watch. They have really good cast so I think that this is as good at the japanese drama. it is good to watch short social drama about marriage and divorce. I am looking forward to it. Is anybody watching? Has anyone seen the Japanese version? I like Cha Tae-hyun and Bae Doona, and Lee El is growing on me. I'm enjoying the more introspective style of this drama. This is a difficult one for me. I really liked the Japanese original, Saikou No Rikon. I loved Ono Machiko in the role played by Bae Doona in the remake. Despite thinking that Bae Doona is the best actress ever, I was worried how she would handle this role. She did a lot of terrific comedy earlier in her career (6 Love Stories is probably my favorite Korean drama), but it's been a while since she's gone all-comic (though there were hints in Secret Forest/Stranger). I didn't know much about Lee El, but I recently saw her in What a Man Wants on a United flight to Tokyo a few weeks ago. I think that she's excellent in the Maki Yoko role. And, while I like Cha Tae-Hyun, it's been a while since I've really been impressed with his work. That said, I liked episodes 1-2 a lot. The writing was very good. The adaptation of the original to this remake has been done well. And I came away really liking the interaction between Bae Doona and Cha Tae-Hyun. Their relationship is complex and has been portrayed well. I'm looking forward to following this drama. I watched ep. 1-2. I like the drama, it has comedy. But I pity the wife, she doesn't really want divorce. I wonder when will the husband realize he loves her. This is an oddly charming drama LoL. I thought the subject matter might be too heavy? But I guess it's thanks to its solid cast it works. The dating rumors of Bae Doo-Na & Son Suk-Ku must be true 'cause they're co-stars again. Poor Cha Tae-Hyun he plays a hapless character but it seem familiar to his previous roles as well.. Doo-Na's unexpectedly funny. The Monday-Tuesday series is an adaptation of a popular Japanese drama that made a splash on Fuji TV in 2013. In it, two more or less average couples start divorce proceedings just because they can’t get along. “The drama is based on how men and women think differently about dating and marriage. Men and women have differences in their thinking about why marriage is difficult,” producer Yoo Hyun-ki said at a press event held Friday in western Seoul. “The original production had (a distinctive) voice, and it raised issues in Japanese society. We’re going to follow (the storyline and other details), but a remake has to be different in some ways, being a separate creation,” Yoo said. “There are differences between Korean and Japanese society. While the original work’s female characters are more timid and passive, (the characters) in our production are more active and know what they want to do,” the producer added. Starring Bae Doo-na and Cha Tae-hyun as the main couple, the show depicts the pair continuing to live together for practical reasons as they wait for their house to be sold. During this time, they grant each other the freedom to date other people. “I was worried because this is a remake of a hit drama. I had thought, ‘If we can’t perfectly localize the drama, why should we (try to improve on) a masterpiece?’ But reading (the script) I really liked the lines and somehow thought, I can do this role well,” Bae said. “I know that some people might feel uncomfortable with the title. But this is a fun, amusing drama in its essence, depicting how four mischievous characters go through a divorce,” she added. Actor Cha, who is adored by many for his sweet, gentle character, is to play Bae’s husband. From starring in the weekly entertainment series “2 Days & 1 Night” on KBS, he has gained a large fan base. The “Along with the Gods” star has mainly played kindly, good-natured characters. But this time he will be a cranky husband with a short temper. “The role is different from my usual roles. But I liked the script and the role, and I really wanted to work with Bae. That accounted for 70 percent of my choice,” he said. Married in real life, Cha says he can relate to some parts of the drama but can’t understand other aspects because they differ from his reality. In cases like that, the show’s staff members help him get a clearer understanding of the issues. “Although it deals with the (heavy) subject of divorce, the story is light and fun,” he commented. 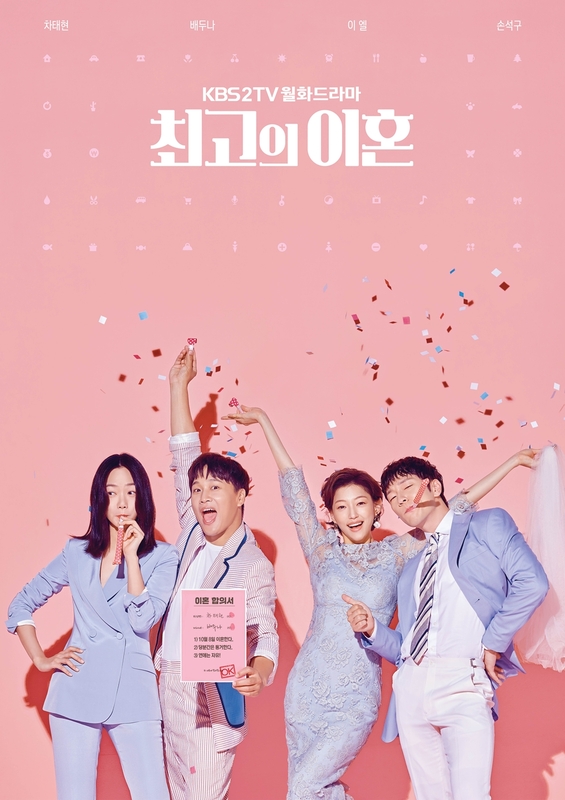 The 16-episode drama starring Cha Tae-hyun, Bae Doo-na, Lee El and Son Suk-ku is scheduled to air its premiere episode on Monday at 10 p.m.
Obviously didn't understand Yuka's character. Or any of the other female characters in the original, for that matter. watched the first two episodes. and all i have to say is that i really like this drama. haven't watched the japancese version yet but happy to say that I LOVE THIS DRAMA, I really enjoy this slice of life kind of drama where everything just hits close to your heart. Each character is being portrayed beautifully. I can't wait for next week's episode following that major cliffhanger at the end of episode 2. PS. thankful that not just the main characters but also the side characters are giving me LIFE! The husband tells the wife things about his childhood, about the dog Autumn and he wanted his dad to allow him keep it for some days. He can open up to his ex wife about things bothering him. Isn't this sign of love? Just finished episode 1-2. These episode seems really short but I had blas watching it. I love Bae Doo Na. In the end of the episode , It seems the wife is alway late for a reason and she knew him when they were young. Plan on rewatching episode 1-2 again because I think I missed something. Seok Moo has a major major proble, he hates his job as a security service guy. His company's clients are so rude and act like they are the only client this company has. It really richard simmons me off. Seok Moo doesn't even pay attention to his wife and all she wants is for him to see her. I love the way they told us how they met when in fact it wasn't the first time. As he told his story, I have come to the conclusion that Seok Moo is sooooooo CLUELESSS. It was clear as day , that these false alarms were to get his attention and when it wasn't one he wasn't there to save her..
Will come back after wathing the other episodes.